Vatican City and Rome with family in two days. We arrived in Rome from Civitavecchia after a 7-day Greek cruise. The port town is over an hour from Rome and our cruise line offered transfers and a 4-hour tour of the Eternal City so we signed up. Since we were in Italy in July, the one thing that was of the utmost importance to me was that the bus was air-conditioned. Nothing else really mattered. The first stop on this Sunday morning was the Vatican. I have seen 3 Popes conduct Mass in the USA but have never been to the Vatican so I was super excited. Security to get into Stato della Citta del Vaticano aka Vatican City was strict. You must walk through 2 separate magnetometer checkpoints and armed military are everywhere. Luckily, we arrived early and we had the massive Piazza San Pietro to ourselves. We were warned about pickpockets in advance so we were extra vigilant. Papal Mass was scheduled for noon but we weren’t going to be there at that time which was disappointing. We then were enthralled at the St. Peter’s Basilica and I have never seen a more beautiful church in my life. It is not only the center of the Catholic Religion but it is also renowned for his Renaissance and Baroque architecture. Everywhere you looked and walked you would see genuine masterpieces. It actually feels holy. I wandered around and never wanted the hour to end and we were fortunate to witness a Baptism in one of the side chapels. I really wanted to see the Sistine Chapel and I should have known this fact but it is not part of the Basilica but a separate venue and it was closed during our visit. Vatican City is a UNESCO World Heritage Site and should not be missed. Time for espresso and something sweet. Did I mention that it’s hot in Rome during noon time in July? Well, it is. 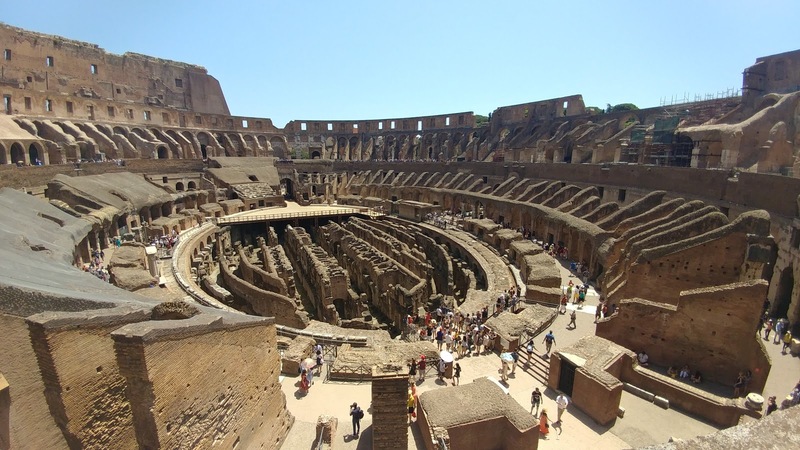 Our motor-coach then circled the area around the Colosseum when I first realized the how enormous the amphitheater is. If you don’t like crowds be forewarned there are tourists and people everywhere trying to sell you bottled water/ souvenirs prior to entering the historical site. Our guide told us that in ancient times the Emperor financed and provided the Colosseum for his people as an entertainment venue. The events around 80 AD were a big deal with free food, wine and entertainment involving gladiators, criminals, and animals, such as lions. The details were ghastly. Our guide explained that the noon events were sparsely attended because of the heat and the most gruesome because condemned prisoners were thrown to the hungry animals. Later in the day, the place was packed with onlookers enjoying the festive atmosphere while famous gladiators dueled animals. Some of the beasts had it almost as hard as the condemned prisoners because they were kept in a dark cellar and not feed for days at a time. Although this is a must-see for any tourist I did not enjoy the Colosseum. 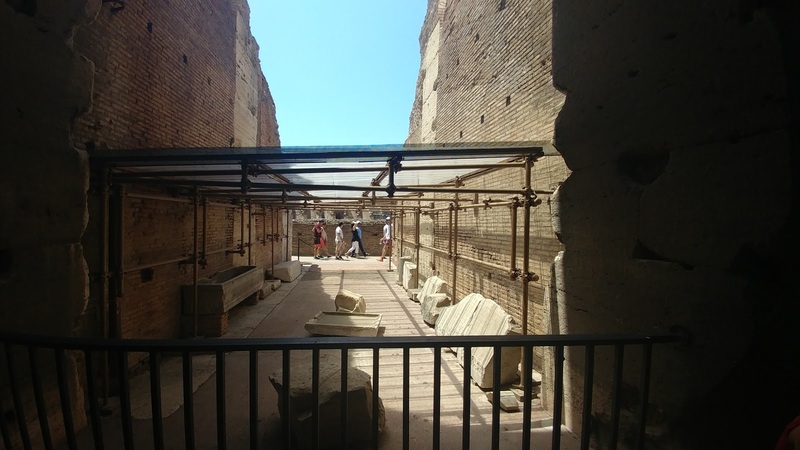 First off the security is very tight outside the venue, but once inside you will quickly notice that the bars on the windows, which prevented gladiators from escaping, might prevent you from escaping if an emergency should occur. It was just too hot and crowded for me and the history of the executions made my stomach turn. My opinion doesn’t matter on this subject because everyone else seemed to enjoy this site very much. While in Rome we stayed at the lovely 3-star Albergo Cesari, which first opened in 1787, right in the center of the Eternal City. It is family owned and operated and the staff could not have been more welcoming. We enjoyed the 5th-floor outdoor rooftop breakfast buffet overlooking the city and it is within a 5-minute walk to the Trevi Fountain and the Parthenon. This hotel might be older but it has some much-appreciated features such as room-silencing shutters, air conditioning, several English language television stations and a caring staff. I highly recommend this lodging option. 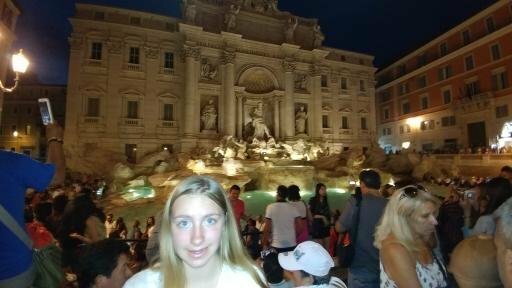 We walked over to the Trevi Fountains but couldn’t get close because of the crowds. So we tossed a coin, snapped a pic and toasted la dolce vita. We spent the next day strolling around Rome. We particularly liked the Spanish Steps and its surrounding area. The 200-year-old, 138 steps appear to made of marble and are much wider than I imagined so there’s plenty of space to people watch. After you ascend the steps your view of Rome is breathtaking. A few blocks behind the Spanish Steps is the Villa Borghese Park. This place was a perfect destination for a hot Roman afternoon. It is full of tree line paths where you can stroll, rent 2-person bikes or paddleboats for its lake. If you like the fresh air you’re going to want to visit this park. One of the coolest parts of the park is all along the pathways there are marble busts of famous men from history. We searched some 30 busts and could only find one bust of a female historical figure and that was the Blessed Virgin Mary. There must be more ladies’ statues but we never saw any more. I really enjoyed spending time in this park. And just like that our trip to Rome was over. I will miss the history lessons on every block, the pasta, and the people watching. 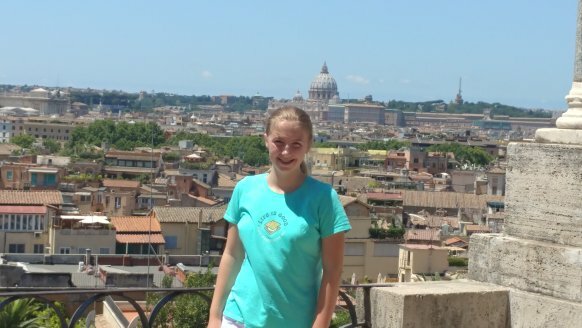 Rome is such a nice city! I enjoyed my trip there!